Virginia big-eared bat - photo by Jeff Hajenga / U. S. Fish and Wildlife Service - Northeast Region (on Flickr - use permitted with attribution). 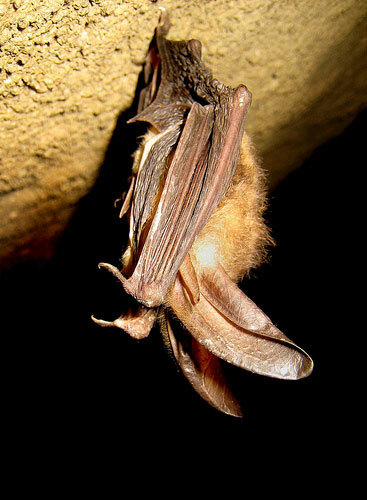 Virginia big-eared bats are listed as state and federally endangered, mainly due to their small population and limited habitat and distribution. 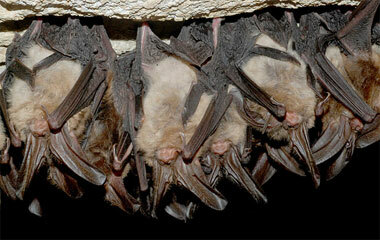 Cluster of hibernating Virginia big-eared bats - photo by Craig Stihler / U. S. Fish and Wildlife Service - Northeast Region (on Flickr - use permitted with attribution).